Blockout is an emulsion-like chemical. It is used to cover pinholes and to “block out” any area of the screen that ink should not pass through. 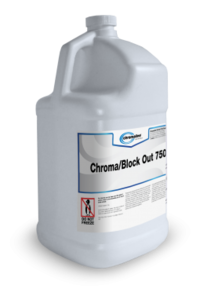 ChromaBlock Out 750 Filler is a red, heavy duty, water-soluble liquid blockout designed for use on all mesh types. It offers excellent coverage as well as biodegradability, very low toxicity and zero VOC. ChromaBlock Out is very durable and suitable for long running jobs. When used with water-based inks, it is advisable to test product for durability on long runs. ChromaFill is a red screen blockout whose water-based formulation is used in the screen room with all types of stencil products to fill large areas of open mesh and touch up pinholes or other image area defects. FOTECHEM 2010 is a non-flammable, self drying and solvent resistant screen filler. It can be decoated with water and is ready-to-use. FOTECHEM 2010 can be used with coarser synthetic meshes and all steel meshes for coverage with a single coat. It is suitable for use on low mesh counts. 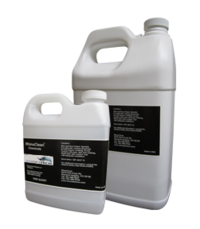 FOTECHEM 2060 is a non-flammable, self drying and solvent resistant screen filler. It can be decoated with water and is ready-to-use. FOTECHEM 2060 can be used with coarser synthetic meshes and all steel meshes for coverage with a single coat. RB 201 is a blue, two part blockout that is easily spread onto a screen. RB201 can be solvent-resistant if the catalyst is added before use. RB 202 is an easy-to-spread screen blockout. It dissolves in water and can be easily reclaimed. RB 203 is a fast drying screen blockout. It dissolves in water and can be easily reclaimed. RB 203 can also be thinned in water.